With the arrival of spring, you may be due for a fresh start around the house. Better organization is a great way to do just that and a little organizing now can save a lot of stress and money in the seasons ahead. 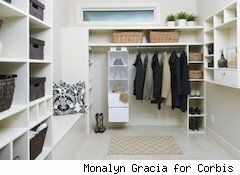 There are many smart, inexpensive organization products out there, but the first step toward real savings is creating a system that will stick when life happens.In a recent homeowner survey by California Closets, 38% of women said that after organizing their closet, it only stays that way for three months. So it's definitely worth it to plan and organize effectively the first time around; otherwise, you could be heading back to the drawing board and the nearest Container Store come summer. Another big money-saver in home organization is knowing exactly what you have and where everything is, especially when it comes to pantry goods, toiletries and home care supplies. Sounds like a no-brainer, but who hasn't picked up an item at the store and later found two nearly-new bottles of the same thing hiding in a cluttered cupboard? Kitchen: Store canned goods and spices on their sides in drawers to prevent the development of a "food museum" in the back of a cabinet. You'll be able to see what you've got in stock and avoid buying duplicates. Bedroom closet: When tackling closet organization, place hangers in backwards and return items to the closet with their hangers facing forward. After six months, remove clothing that hasn't been worn and either store it or give it to charity. Kid's room: Make sure rods and shelving are low enough to reach, and choose adjustable systems that can change along with a child's needs as they grow. Garage: Use containers, racks, baskets and wall hooks to keep garage contents off the floor for safety and easy access. Tom Kraeutler delivers home remodeling tips and ideas and more each week as host of The Money Pit, a nationally syndicated home improvement radio program. He is also AOL's Home Improvement Editor and author of "My Home, My Money Pit: Your Guide to Every Home Improvement Adventure."